Jean-Marc Foussat has an active presence in Europe as an avant-garde composer-improvisor who occupies a space on the free-avant jazz scene. The CD at hand today would appear to be pure composition, an elaborate noise-and-tone electronic music suite, L'oiseau (FOU CD-01). It is in memory of his son Victor (1985-2012), a memento mori honoring his passing. The work is in two central sections, "L'oiseau" itself, and "La vie s'arrete". In between is the voice of Victor himself, reciting a brief poem. Foussat's music must be digested in several hearings to be fully appreciated. Loops and their subtle use contrast against sometimes very thick, noisy soundscape panoramas. Pattern and form emerge from the seeming chaos as one listens repeatedly. It shows us an electronic composer who does not attempt to construct sounds to comfort the audience. It is rather music on the edge of itself, not disturbing as much as expressionistic. Walls of sound vary in intensity and density in ways that seem to express that which words fail to do. The bird-like, the living creation sort of sounds contrast against a sort of brutal industrialism in a dichotomy that fascinates as it perhaps gives us pause. We do live in such a multivalent world. There is no one, yet all of it gives us one experience, of our lives. Of Victor's life. That is my impression, not necessarily exactly what Jean-Marc intended. Suffice to say that this music becomes intelligible when one listens closely and repeatedly. I find it very engaging, intense, yet also very poetic. Recommended for those avant adventurists out there. I have a strong personal affection for the music of Algerian musician Jean-Marc Foussat, mainly because I find he’s a total whizz of invention when it comes to playing the VCS3 synth and because that particular instrument scores so high on the desiro-cheerometer of many fans (it’s clunky, it’s analogue, and Brian Eno used it with Roxy Music). Foussat has realised a good deal of his own superbly robust free-noise music – 1983’s Abbatage is a real heavyweight – and formed ad-hoc groups like Marteau Rouge and Thrash The Flash whose team members have produced gloriously unfettered and juicy instances of unrestricted noisy batterings. Alongside his work as a composer and musician, his name appears on the technical credits for many important recordings of European improvised music from the 1980s onwards, for labels such as Incus, Bead, Po Torch, Hat Art, Celluloid, RecRec, and many more. I’m always a bit baffled as to why his profile isn’t that bit higher than it appears to be, but it may be because he is just a modest hard-working fellow who doesn’t spend time on self-promotion and ego-preening vanity ads. Such a man, y’know you can trust. As to modesty, his name doesn’t even appear on the front cover of L’Oiseau (FOU RECORDS FR – CD 01), a release which he kindly sent us in October 2012, yet it’s all performed by Jean-Marc using the AKS and VCS3 synths, and he also performs additional electronic generation, voice elements, toys, and the Jews Harp. 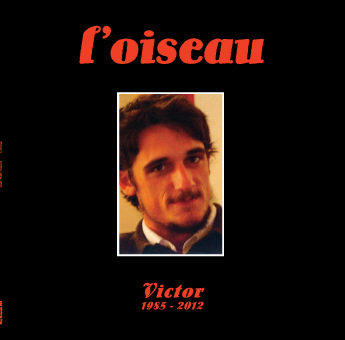 The album is dedicated to Victor Foussat, a painter and poet (and relation?) who died in 2012, apparently quite young. That’s his photo on the front cover and a painting by him on the inner sleeve. On two long tracks, Jean-Marc unburdens his emotional state with courage and dignity. The title track is a bittersweet assemblage, composed of multiple synth recordings carefully chained together, some way from the pounding noise assault of Marteau Rouge and amounting to a heartfelt statement of very mixed emotions – mourning the loss of Victor, while also celebrating the glories of art / poetry and thus delivering a suitable musical eulogy of sorts. It’s gorgeous to listen to, a controlled and sustained meditation in electronic sound, freely moving in time and space with quicksilver changes of tempo, timbre and tone – Foussat is a master programmer, exhibits tremendous facility and spontaneity in his work, and unfailingly produces great electronic music with the speed and grace of an entire army of soldier ants. Much contemporary electronic music seems stale, clumsy, or ponderous in comparison. ‘La Vie S’Arrête’ is quite a different piece, a more discordant and dissonant “howl” generated by roaring synths and drawn from a more abysmal part of the soul; of the two, certainly the “nocturne” of the suite. In among the unhappy sighs, groans, and extended whispering utterances of the VCS3, small bursts of real-life field recordings creep in, only to be overwhelmed by the crushing emotions of the music. The sound of the crowd (children at play or a shopping mall) is rendered rather insignificant in the face of one man’s personal trauma and pain. This piece follows the same vaguely “episodic” structure as its predecessor, one segment of music overlapping the next in an intuitive programme of fades and layerings that create a steady continuum, a perfect flow of ideas. Yet you can sense the mood becoming bleak and forlorn as the sounds grow more thin and attenuated, conveying a feeling of futility where a life has indeed come to an end and the rest of us are not sure what to do next. Bird song – probably produced by synthetic methods – looms large in this piece, and the echoing repeats of these near-absurd twitterings and chatterings somehow evoke what has been lost with the passing of this painter and poet. A subtle and sensitive portrait emerges from this very sympathetic music. In between the two compositions, Jean-Marc Foussat takes one minute to read out a poem by Victor Foussat, ‘L’oiseau aux plumes bariolées’ – at which point your listener started getting a lump in the throat.